A: The answer to this question depends on many factors. 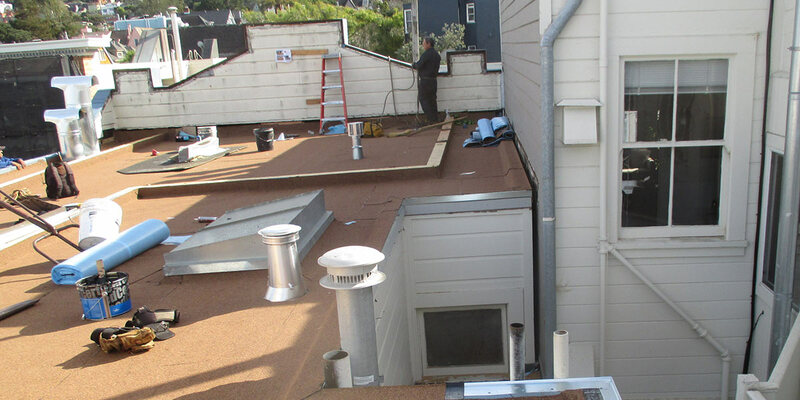 For a commitment-free quote, please contact our Sales Department at 415-822-4488. A: Gutters should be cleaned at least once a year. BUSINESS HOURS: Are 8:00 a.m. to 4:30 p.m., Monday through Friday. Unless otherwise noted, general start time is 8:30 a.m. and stop time is 4:30 p.m. Overtime may occur without notice. We do not offer nighttime service. COMPLAINTS AND CONCERNS: Are usually handled very promptly, depending on the time of day. Never delay in making a call, regardless of the time of day or day of the week. Our answering machine receives calls 24 hours a day, seven days a week. The faster you contact us, the faster we are able to respond. ROOF REMOVAL: The reroofing/tear off is labor intensive and causes vibrations that may cause items to fall, plaster to crack, and nails to back out. Sidewalks and driveways may get cracked from the weight of trucks. These are common and cannot be prevented. When removing and replacing existing roofing, gravel, dirt, shingle debris and tar will fall into attic space on top of the ceiling or open garages. Any items of value must be removed. Also, any openings in ceilings, i.e. hatch covers, vents and canned lighting, will be susceptible to roof debris and dust infiltration which we cannot be responsible for. Please bring these areas to our attention so that we may be helpful. ANTENNAS AND CABLES: Alarm, television, phone cables and electrical wires are sometimes buried under the existing roofing and/or deteriorated from the elements. If these items break, or are otherwise damaged, we will notify you, and it will be your responsibility to hire the appropriate repair person. Antennas and satellite dishes may need to be readjusted by a repair person after removal and replacement of roof. JOB CLEANLINESS: Our goal is to emphasize the reroofing job first, and cleanup to be done during and last. When removing roofing, we need access to water and electricity. This allows us to mist the roof (not done on shingle slopes) with water to create a more dust free environment for workers and property protection. Electricity can be used for saws, drills, etc. if needed. Cleanup is very important to us and cleaners are used when appropriate. Tarps are used to cover decks and plants. Sometimes the weight of the tarps can cause breakage to fragile plants that we cannot be responsible for. DRY ROT: Is not common in reroofing projects. However, any dry rot that is less than 100 sq. feet will be included, so long as it is not structural. Dry rot in the plywood sheathing, or solid sheathing greater than 100 sq. feet and dry rot that is structural (any amount) will be charged at time and material basis $60.00 per hour, per man. No dry rot work that will be intended by us to be an additional charge will be done unless you are first notified. In rare cases, dry rot is so severe a General Contractor may be needed to bid and do work. PONDING WATER: Most flat roof surfaces may show signs of ponding water. This is due to the construction. It is generally considered not to be a problem in small amounts. We cannot be responsible for ponding water after the new roof is installed. Unless otherwise stated, the proposal does not include the removal or lessening of ponding water. OVERNIGHT PROTECTION: All jobs will be protected from wet weather each night. This will be either by the roof being water tight and/or tarps. Sometimes these procedures are not 100% successful, even though we have made every possible effort. We cannot be responsible for unexpected or unusual rain, causing damage. INSURANCE: At the owner’s request, Certificates of General Liability Insurance and Workers Compensation Insurance are sent via mail. REFERRALS: It is not our policy to ask previous customers to be put in a position to communicate with new customers. However, if requested, this will be accommodated. An address may be given out, so that a potential customer may drive by and look at a previous job, or a telephone number may be obtained for referral communication. CONTRACTS: By law (California State Contractors License Board) all jobs over $500.00 must have home improvement contracts with certain wording and enclosures, which we include. Verbal Agreements do hold up in a court of law. However, it is in the best interest of both parties to have written contracts. Small additions to the contract may be verbal. However, large changes should be in writing. A deposit may be required (not to exceed $1,000 or 10 percent of the contract price).